6 years. 6 years is what it took to finally step foot on the playa. 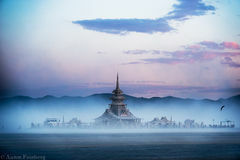 Having heard the repeating calls to join friends year after year the stars finally aligned to make attending Burning Man and being a citizen of Black Rock City (BRC) an actuality this year. While I knew that I had a calling to be there, seeing photographs and videos, feeling that connection to a place I knew nothing about I still feel I went in with no expectations. Which I know now would have been impossible anyway. It truly is one of those experiences in life that is indescribable other than one's own existence there. As we, BRC citizens return to our 'normal' lives there is of course the process of answering the questions. Of course the most prominently one being, "so how was it?!". And each time I find myself taking a deep breath, gently shaking my head and then trying to grasp the words. What I've settled on is, not necessarily a personal experience, but what I viewed the entirety of the event to be; the most pure form of freedom and self-expression that exists. In fact, I just got chills after writing that. You are surrounded by a group, a family of people, 50k+, in the middle of a completely inhospitable desert to celebrate/collaborate/mourn/journey/create…the list goes on. Everyone there. For the same reason. There\'s an indescribable bond between everyone that I met as our walls are all down. We are exposed…physically, emotionally, mentally to the experiences that surround us. Connections can be fleeting but intense. Interactions that can last a few moment, days or perhaps a lifetime but all have their place in our adventure out in BRC. "You Gotta Go, To Know"